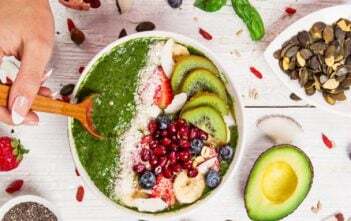 Public health experts traditionally expect to see a very strong pattern of health inequality – the poorer you are, the more likely you are to be unwell and die before your time. But newly available data on cancer incidence rates show that’s not always the case. 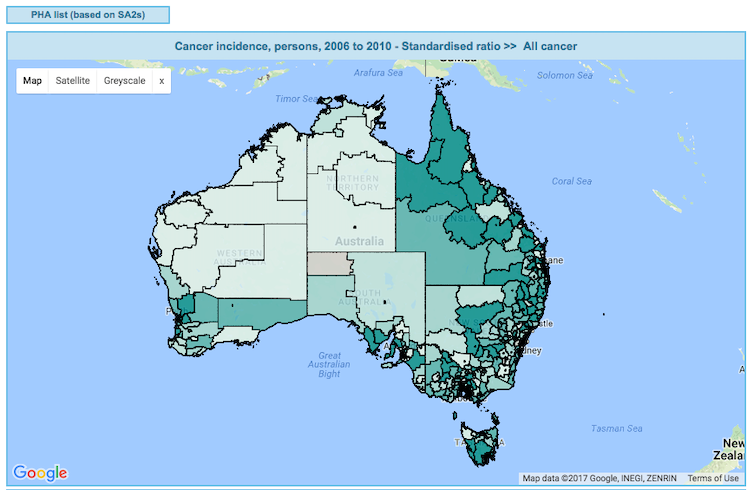 Our team at the Public Health Information Development Unit (PHIDU) used data from the Australian Institute of Health and Welfare’s 2012 Australian Cancer Database to map cancer incidence rates across Australia – by state, by socioeconomic status and by remoteness. 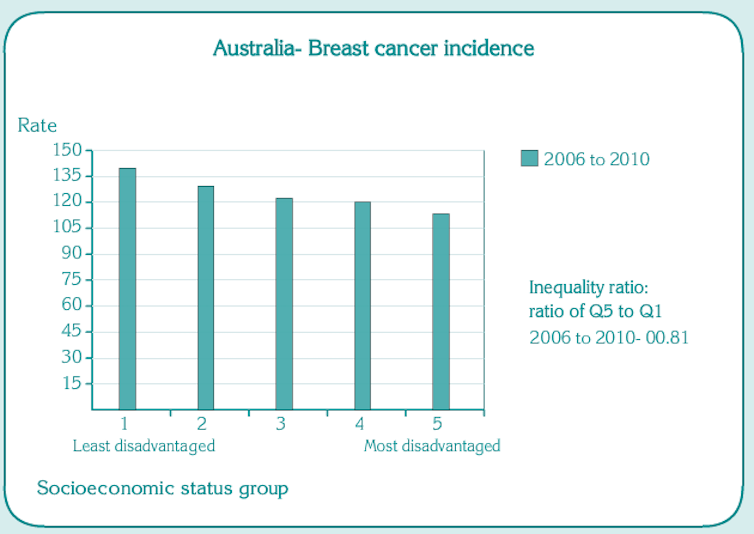 We found generally high rates of breast cancers diagnosed for females in the most advantaged areas when compared with more disadvantaged areas. That is, well-off women were more likely to be diagnosed with breast cancer than their less well-off counterparts. PHIDU, using data from AIHW/ACD. 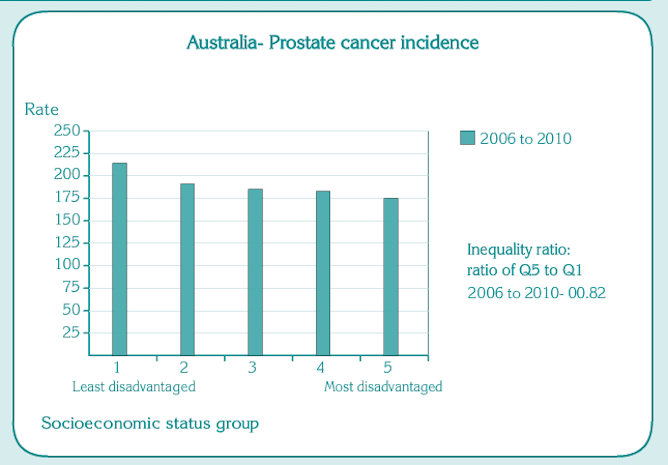 The same pattern emerged for prostate cancers diagnosed in males – the more well-off a man is, the more likely he is to be diagnosed with prostate cancer. 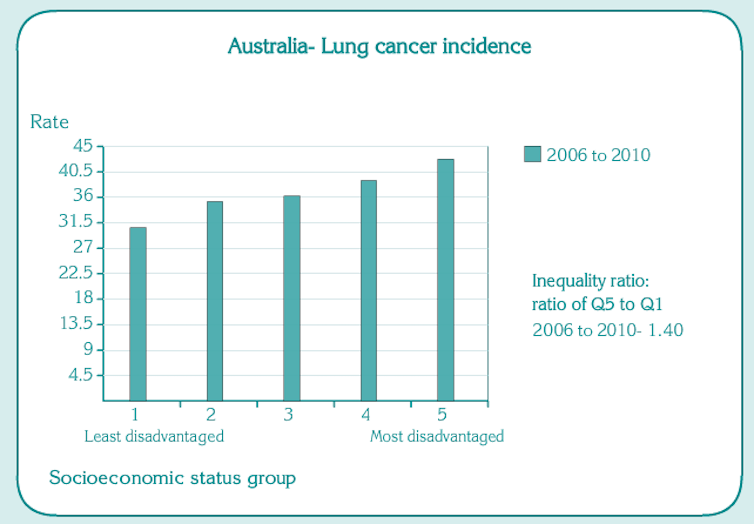 However, the numbers also reveal high rates of lung cancer in the most disadvantaged areas. That was true for both men and women. It seems that the less well-off you are, the more likely you are to be diagnosed with lung cancer. Lung cancer incidence rates in Australia among women, by income quintile. PHIDU, using AIHW/ACD data. Lung cancer incidence rates in Australia among men, by income quintile. PHIDU, using AIHW/ACD data. 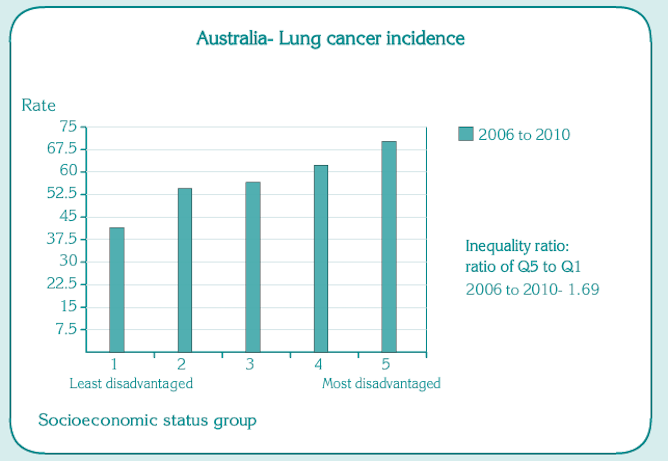 Lung cancer incidence also increases with remoteness, being 47% higher in the very remote areas of Australia in comparison with the major cities for females and 49% higher for males. On the other hand, there is a 20% lower incidence of breast cancer for women living in areas classified as very remote, when compared with major cities. Incidence rates for the total cancers are highest in Queensland, driven by very high rates of melanoma of the skin. Cancer incidence rates, persons, by area of population health areas. Darkest colours show highest rates. Our analysis of cancer incidence rates showed a mixed picture when it comes to the link between how well-off you are and how likely you are to receive a cancer diagnosis. But for many other health indicators, the correlation is very strong: the more disadvantaged you are, the more likely you are to have poor health outcomes. This analysis of other health data reveals that, despite Australia’s enviable health standing in the international arena, there is a substantial health gap between the most advantaged and most disadvantaged Australians. Some of this gap can be put down to biology and genetics, individual behaviour, health service access, and the physical environment. But a major contributor to the gap is people’s socioeconomic status. The inequality is evident in levels of obesity, diabetes, circulatory diseases and psychological distress. For all of these measures, the problem is greater, and in many cases much greater, among the most disadvantaged. 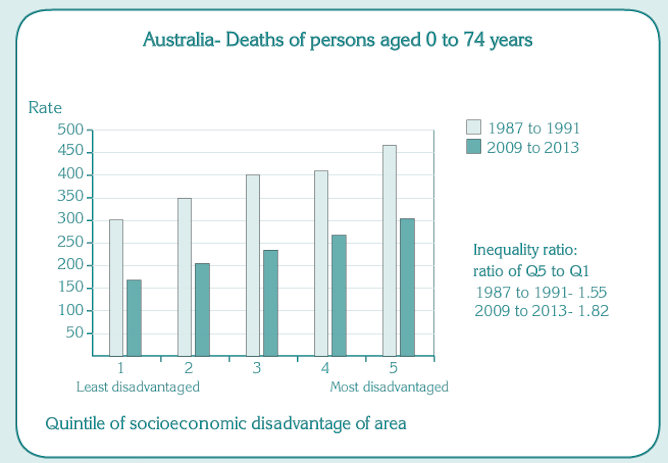 And there is a striking gap in the rate of premature deaths (less than 75 years of age), whether we look at the capital cities, or regional or remote Australia. It is also clear that it is not just a case of a difference between the “haves” and “have nots”. There are more premature deaths at every step across the social spectrum. That is, all but the 20% who live in the most socioeconomically advantaged areas have higher death rates. Public health experts call this the “social gradient in health”. What is of greatest concern is that we are seeing a widening in the health gap, as seen in a comparison of premature mortality over time. Yes, there have been substantial reductions in the rates of early death overall, with rates down by 50% in 2014 when compared with 1987. However, this significant reduction was not shared by all. The reduction in early deaths was lower for those living in the most disadvantaged areas when compared withe the most well-off areas. In fact, the gap in rates between these population groups has increased, and increased substantially. The data show us that in 1987 there were 42% more deaths in the most disadvantaged areas compared to the least disadvantaged; by 2013, rates were 76% higher among the most disadvantaged. Put another way, the current (2013) rate in the most disadvantaged areas, of 256 premature deaths per 100,000 population, was surpassed for those living in the most well-off areas in 1997. These are disturbing findings, highlighting a major inequity. This situation, however, is not inevitable. The socioeconomic environment is a powerful and potentially modifiable factor. Good public policy – particularly in areas such as housing, taxation and social security, work environments, urban design, pollution control, educational achievement, and early childhood development – can help make a difference to addressing these problems and reducing the health inequality gap in Australia.